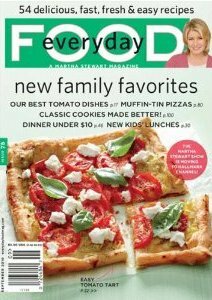 Everyday Food from the test kitchens of Martha Stewart Living was a digest size cooking magazine and PBS public television program published and produced by Martha Stewart Living Omnimedia (MSLO). Both feature quick and easy recipes targeted at supermarket shoppers and the everyday cook. Everyday Food was established in 2003. The television show, which is distributed nationwide on PBS by WETA-TV, includes recipes and tips from the magazine and is hosted by five members of the MSLO senior editorial staff. It stopped print versions in December 2012. A companion series, Everyday Baking from Everyday Food, with John Barricelli as the principal chef, is also presented on PBS by WETA-TV. Unlike most other PBS cooking shows, these programs are heavily edited, using extreme closeups, and never show any of the product brands used. ^ "eCirc for Consumer Magazines". Audit Bureau of Circulations. June 30, 2011. Retrieved December 1, 2011. ^ Lucia Moses (November 1, 2012). "Martha Stewart Puts Everyday Food on Crash Diet". AdWeek. Retrieved February 6, 2016. This article about a food, drink, or cooking oriented magazine is a stub. You can help Wikipedia by expanding it. This page was last edited on 13 November 2017, at 03:22 (UTC).